In 1977, the ultra-entrenched Demoratic mayor of Albany, Erastus Corning 2nd—who had been in office since 1942—faced a primary challenge from a candidate seeking to shake up the status quo. That's the backdrop of Sharr White's The True, which, on its surface, seems like an allegory about the Democratic Party's current state of affairs. But the show is not really about politics; it's about the people behind them, specifically Dorothea "Polly" Noonan (Edie Falco): a fierce and profane defender of the party and politico she adores. 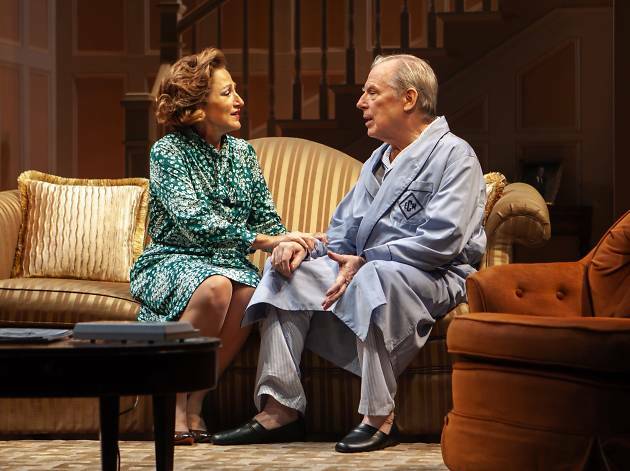 Because the play is set when Corning's career was on the wane, it's hard to understand what Noonan sees in him, and even harder to buy that her husband (an empathetic Peter Scolari) never put his foot down regarding their too-close-for-comfort relationship. 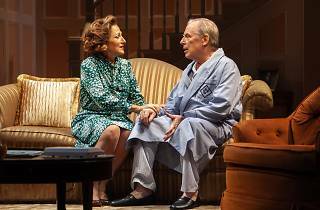 But the play's biggest scandal is its flip-flopping tone, which careers from quippy comedy to political thriller to sentimental nomance. But although The True sometimes seems falser than fiction, Falco is consistently thrilling. Under Scott Elliott's direction, she delivers a rich portrait of an ambitious woman constrained by the gender politics of her time—but who did inspire her granddaughter to pursue a career in government. You probably have heard her name: Senator Kirsten Gillibrand. The Pershing Square Signature Center (Off Broadway). By Sharr White. Directed by Scott Elliott. With Edie Falco, Michael McKean, Peter Scolari. Running time: 1hr 45min. No intermission.